Looking for some fin this summer? 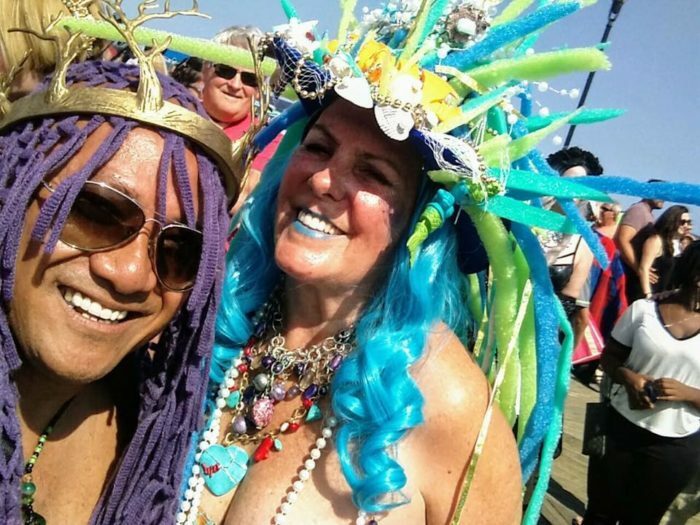 The fourth annual Asbury Park Promenade of Mermaids is June 30 on the boardwalk and it’s LGBT friendly. The boards will be full of mermaids, mermen, pirates and sea creatures of all persuasions. More than 500 participated last year. Like we said, they come in all kinds in Asbury Park. There are pufferfish, guppies, sea horses, lobsters, pirates and octopuses on the boards. The day, which begins at 10 a.m. at the Asbury Park Yacht Club on the boardwalk, is very inclusive, with lots of families participating. There is no charge to walk in the Promenade, but there is a $10 charge to enter the costume contest. The after-party is back at the Yacht Club with the Gypsy Funk Squad and the Jolly Daggers playing. Look for a new attraction on Sunday, July 1. “Actual mermaids will be swimming in the pool at the Asbury Hotel,” Mehmaid said. Visit asburyparkpromenadeofmermaids.com for more info. New Jersey has a whole host of fun festivals and Asbury Park is home to a handful of my favorites. The Asbury Park Zombie Crawl is a classic Halloween tradition but they celebrate other supernatural creatures, as well. They’ve welcomed us to a world of witchcraft and wizardry with Pottercon and invite us all to fall under the spell of magnificent mermaids at their annual promenade. Everyone is welcome to participate in the Asbury Park Promenade of Mermaids. Now in its fourth year, the event will be held on June 30th. It’s free to attend, whether you want to watch or walk in the parade. If you’d like to enter the costume contest, it will cost $10. The prizes are fantastic and profits have helped support charities in the past. Kids and adults alike participate. 9 months? 99 years? It’s fun for everyone! You may even catch a live performance. Last year, there were mermaid belly dancers! 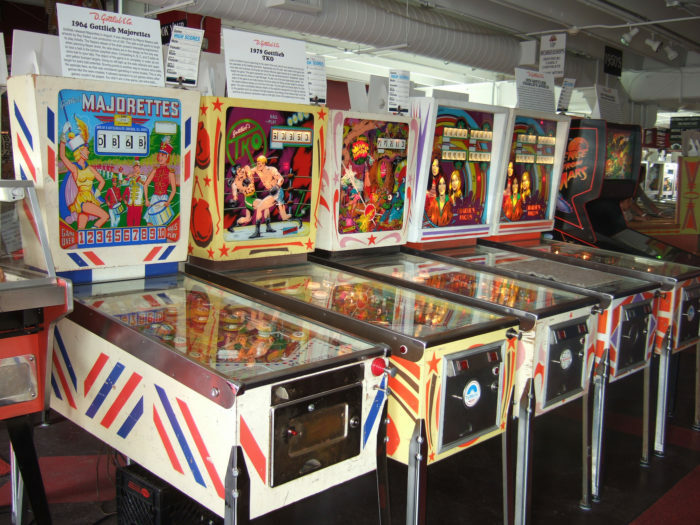 After the festival, check out boardwalk eateries and attractions like the pinball museum/arcade! Or, you can go for a swim at the beach! Have you been to the Asbury Park Promenade of Mermaids yet? Will you be going this summer? While the mermaid parade is sure to be a blast, there’s plenty more to do while you’re in town. Check out this fantastic food truck park, or this paranormal museum and bookstore, for starters. Chris Jordan, @ChrisFHJordanPublished 2:35 p.m. ET Aug. 23, 2017 | Updated 2:46 p.m.
It’s no secret that Asbury Park’s waterfront plays host to classic summertime fun pretty much 24/7 between Memorial Day and Labor Day. But on Saturday, the excitement is set to hit a new high-water mark, thanks to a couple hundred mermaids and some scorching guitars. 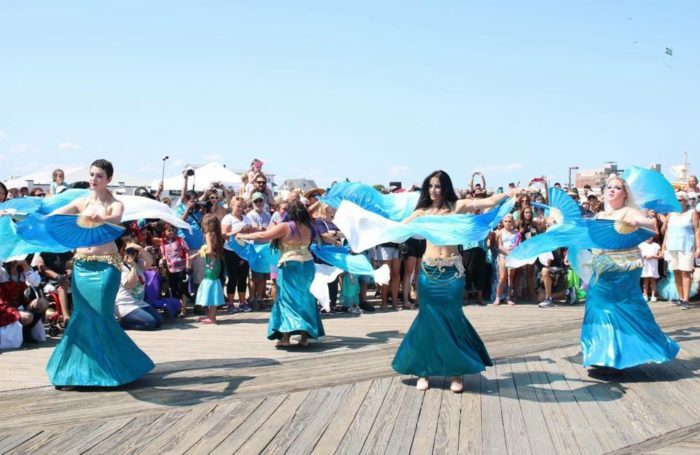 First, the city’s boardwalk will host the inaugural Asbury Park Promenade of Mermaids at noon, then the party goes all day long at the nearby Asbury Lanes, 209 Fourth Ave., for the second annual Asbury Park Surf Music Festival. Mythical sea creatures and surf rock? Sounds like a perfect summer Saturday in Asbury Park to us. 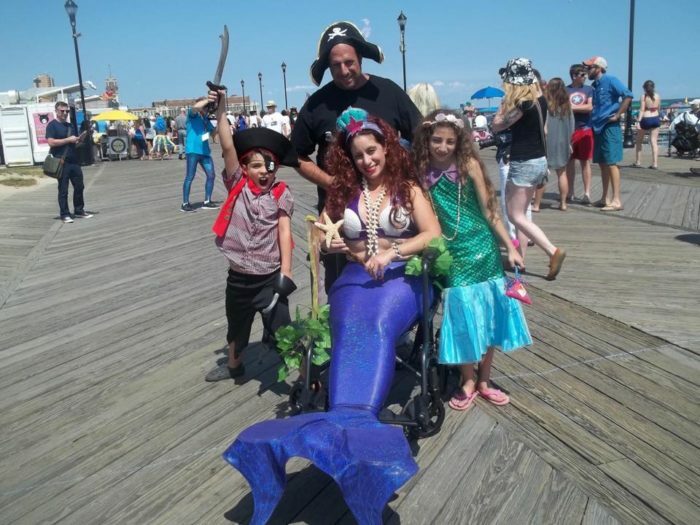 The Asbury Park Promenade of Mermaids is the creation of Jenn Mehm, a Jersey girl and lifelong mermaid aficionado. Originally from Marlboro, Mehm moved to California in 2000 and started the Sacramento Promenade of Mermaids there in 2011. She returned to New Jersey in 2012, moving to Asbury Park in 2013. “I like being near the ocean. There’s something very soothing about it,” she said. 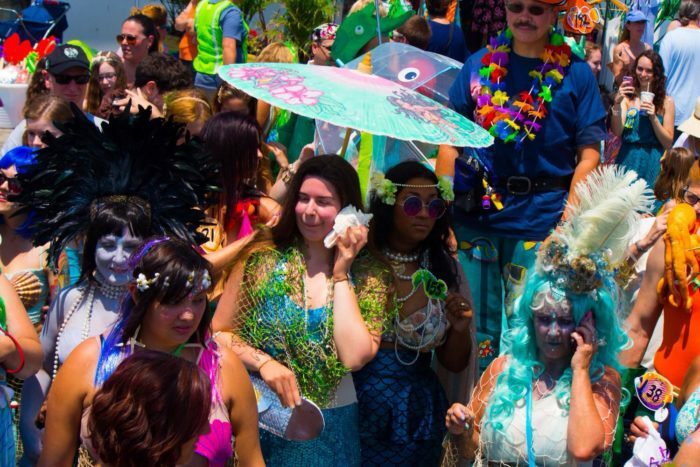 Saturday’s Promenade of Mermaids begins at noon on the north beach side of the city’s boardwalk. It will then make its way south, through the Grand Arcade and to the Casino building, then head back along Ocean Avenue, up Third Avenue and back to the boardwalk, where registered participants’ costumes will be judged by local musician and emcee Don Dazzo. The Promenade is the latest addition to an increasingly-crowded parade calendar for the Asbury Park boardwalk: the city’s Easter Pageant Parade marked its 80th year this spring, and the annual New Jersey Zombie Walk is known the world over. It seems there’s something about the Asbury boards that brings out a sense of pageantry in people. “For us, being mermaids, I think it’s just perfect to have a boardwalk to promenade on,” said Mehm. What gal doesn’t want to be a mermaid? They have a pretty sweet gig. Mermaids don’t need to do laundry. They don’t spend hours hunched over their computers, trying to meet deadlines. They basically swim around with their friends or hang out on a rock, enjoying nature and looking gorgeous. Much like Jersey Girls, mermaids can navigate circles, and they don’t pump gas. In fact, mermaids don’t ever get stuck in traffic. But they do stop traffic. Yes, beauty is a big part of the appeal. Luckily, it is an approachable aesthetic. All sizes, shapes and ages can make it work. 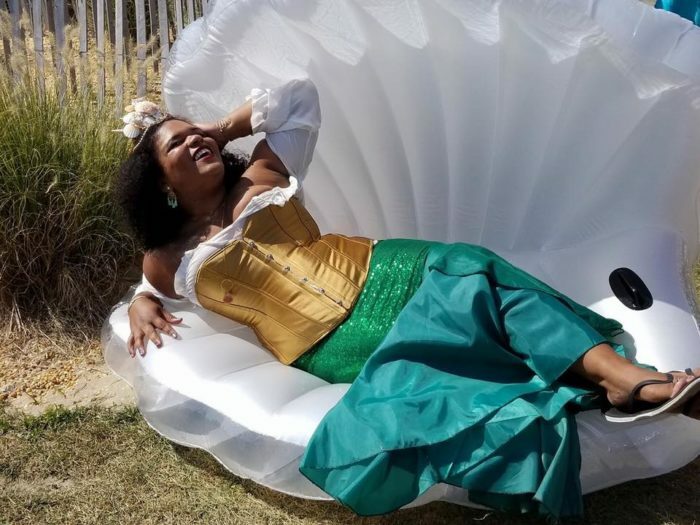 As founder of the inaugural Asbury Park Promenade of Mermaids, scheduled for July 11, Jenn Mehm knows what it takes to make a sea-worthy costume. Mehm also founded the annual Sacramento Promenade of Mermaids, which began in 2011, so she has an extensive mermaid wardrobe. If you’re not that DIY, a bustier or a clam shell bikini top suits the human half of a mermaid, while a store-bought tail with scales and fin is like a mermaid’s Little Black Dress. You can also wear a skirt, as Mehm has, decorated with streamers or other embellishments that give the illusion of a mermaid’s tail. Oceanic jewelry and barrettes accessorize the look. Make-up is key: Mehm goes bold with eyeshadow in aqua and other blue-green shades. Don’t think you need to stick with costume make-up: Hard Candy’s “Emerald Cut” nail polish and eye crayon in “Cat’s Eye” would also do the trick. As a crowning touch, Mehm has worn wigs in neon green and hot pink. She also has a silver wig that she wore as part of a spectacular silver jelly-fish costume. Mehm, a native Jersey Girl who moved to Asbury Park from Sacramento in 2012, is a longtime supporter of New Jersey’s local music scenes, and is known for her creativity. She launched “Drippingwette Gazette,” a music fanzine, on 8/8/88 and published 12 issues through 1990. She founded mermaid promenades on both coasts simply because she thought it would be fun. “Everyone loves a parade and people like to dress up,” she said. “Everyone’s got worries and different things, so it’s fun to be someone else for a day. A lot of people do zombie walks — there are two in Sacramento — and there’s anime and comic cons. “I’m always amazed at what people do. Like at the zombie walk in Asbury Park, I saw a zombie SpongeBob. It just makes you be creative. “In summer, being in the water, that’s the appeal of mermaids, too,” Mehm said. Judging by the logos of the two promenades, the Asbury Park mermaids might be a little edgier than the Sacramento variety. Whereas Sacramento has a voluptuous, long-haired mermaid as its logo, the Jersey promenade’s website also depicts a skeleton mermaid, undulating in the shape of the Garden State. It would make a cool bumper sticker. Pirates, sea creatures and other nautical costumes are welcome in the promenade. Mehm also has made it a point to bill the promenade as “steampunk-friendly,” so it will be interesting to see how many retro-futurist characters will participate. And why shouldn’t they, considering the Promenade of Mermaids is a whimsical descendant of promenades past, stretching back to Victorian Asbury? 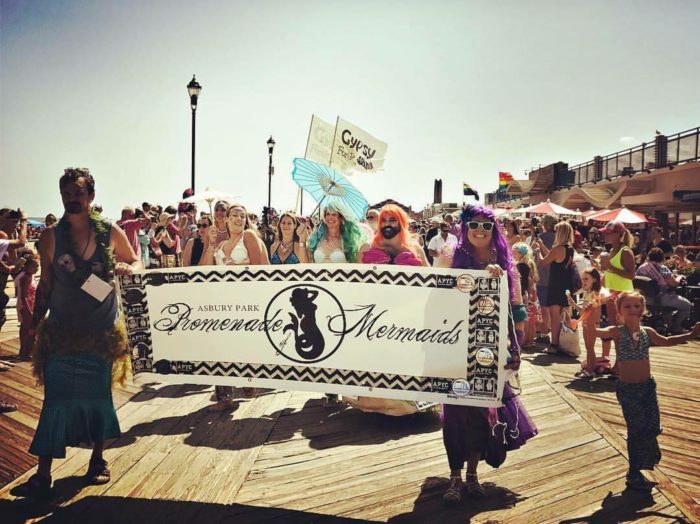 The Promenade of Mermaids is scheduled to begin at noon July 11 on the North end of the Asbury Park boardwalk. There is no rain date because mermaids and sea creatures don’t mind rain, and pirates can bring umbrellas. Mehm credits restaurateur Marilyn Schlossbach, who owns the Asbury Park eateries Langosta Lounde, Pop’s Garage, Lightly Salted and Asbury Park Yacht Club, for helping to launch the promenade with financial support. The City of Asbury Park also lent its support. The event is free, with no pre-registration required to be in the parade. However, if you want to be eligible for prizes, you must register. The organizers offered free on-line registration until June 30, but after that, it’s $5. Mermaids who procrastinate can still register at the check-in area on the north end of the boardwalk from 10 a.m. to noon. All entrants, pre-registered or not, must stop by the check-in area to get their registration number for judging. At noon, the mermaids will march through the Grand Arcade at Convention Hall and proceed down the boardwalk until reaching the Casino. At that point, the procession will turn onto Ocean Avenue, head up to Third Avenue and back onto the boardwalk, where Master of Ceremonies Don Dazzo, a longtime local musician, will welcome everyone and the judges will present the prizes. Prizes will be awarded at the information booth between Third and Fourth avenues. 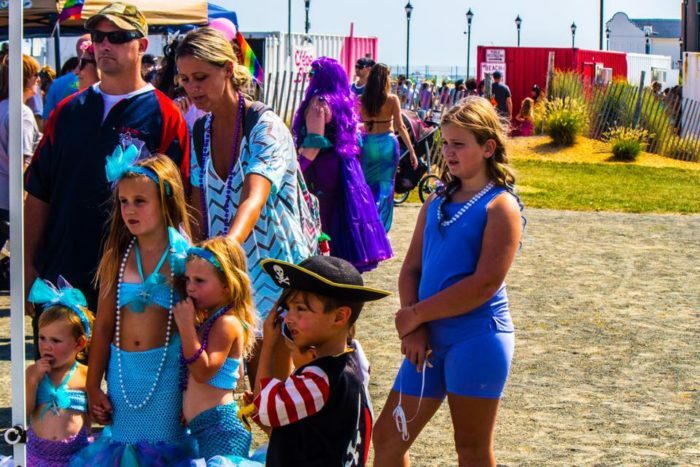 A trio of judges — King Neptune, The Pirate and the Asbury Park Mermaid herself — will bestow prizes for best costume and runner-up in the adult category, ages 15 and older. A King and Queen also will be crowned. The children’s category, for ages 14 and younger, will have prizes for first, second and third place. Additional prizes from local businesses will be given out throughout the day. Prizes are provided by the following Asbury Park-based sponsors: Langosta Lounge, Lightly Salted, House of Trash, Groovy Graveyard, Parlor Gallery, Asbury Lanes, Asbury Park Yacht Club, Flying Saucers, B&G Home, Kill Screen Games, Days Ice Cream, also in Ocean Grove; Pop’s Garage, also in Shrewsbury; Carla Gizzi, also in Red Bank; as well as Artifacts Boutique in Belmar and Vintage Variety in Atlantic Highlands. Discount tickets for mini-golf on the boardwalk will be given to any child in costume, while adults in costume will receive discounted admission to Surf Fest 2 at Asbury Lanes. 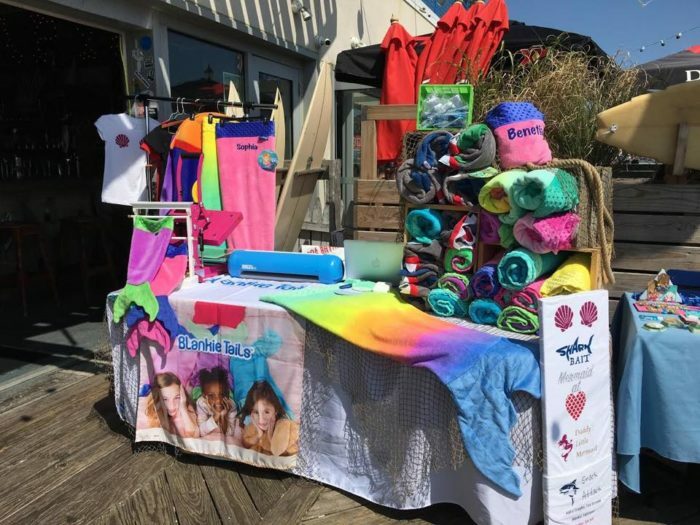 After the promenade, there will be a party at Asbury Park Yacht Club, on the boardwalk, with tunes by DJ Dazzo and mermaid-inspired craft vendors. For more information, go to asburyparkpromenadeofmermaids.com or find them on Facebook.